An Aussie terrorist, Bassem al Sayyed, and his wife were shot dead in a gun battle yesterday in Lebanon after they threw a bomb at police. Both men were followers of radical Sheik Feiz Mohammad who calls for children to become martyrs and labels Jews “pigs”. IT WAS another hot day on the Mediterranean when Ibrahim Sabouh and two Australian friends headed to al-Moun beach in Tripoli, northern Lebanon, for a quick swim before lunch. By nightfall, life would become a lot more complicated. The three are now in military detention, accused of associating with an unnamed terrorist organisation – a connection Mr Sabouh’s Sydney family vehemently rejects, saying he will soon be cleared. In the five years before he moved to Lebanon in 2005 he had become noticeably more devout, a friend said, growing a beard and attending daily prayers. But “he hated to talk about politics”, and used to attend the Global Islamic Youth Centre at Liverpool because it was his local mosque, not because he was attracted by a radical message. The Sabouh family migrated from Elmin Yah, a village close to Tripoli, in 1977, when Ibrahim, the second youngest of eight children, was two. The former financial adviser moved his wife and four children back to Lebanon in 2005 to improve their Arabic. His relatives in Sydney have yet to make contact with him but have denied the claims of him being associated with Fatah al-Islam. 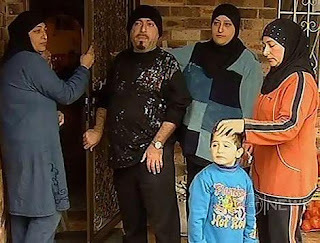 “I don’t know where the hell they got that from,” Mr Sabouh’s nephew, Zac Sabouh, told AAP from his family’s Auburn home in Sydney’s west. Another Australian and his wife were killed in fighting yesterday in Lebanon after they threw a bomb at police. Bassem al Sayyed, and his wife, were shot dead during a fierce gunbattle in Tripoli on Sunday after they threw a bomb at soldiers who responded with a volley of shots. 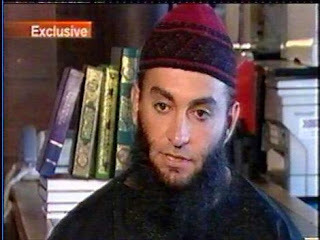 Both Mr Sabouh and Mr al Sayyed were students of radical Sydney-born cleric Sheikh Feiz Mohammed, 37 (pictured), who is also based in Lebanon after he was caught on hate DVDs urging children to die for Allah. – via The Australian. Sheik Feiz Mohammed of Australia says that women deserve to be raped, Jews are pigs and apes etc. Your usual radical Islamic hate speech.